I am a big fan of making huge batches of things. For instance, I may have brought home a sixty-ear bag of sweet corn from the farm down the street this past summer. Twice. That being said, the following recipe will make a huge batch but is incredibly easy to halve, quarter, or divide by any other sized increment. It is also extremely customizable; you don’t like turnips? Not a problem- leave them out, or substitute something else you love. This recipe is all about what youlike, and simple, natural flavor. 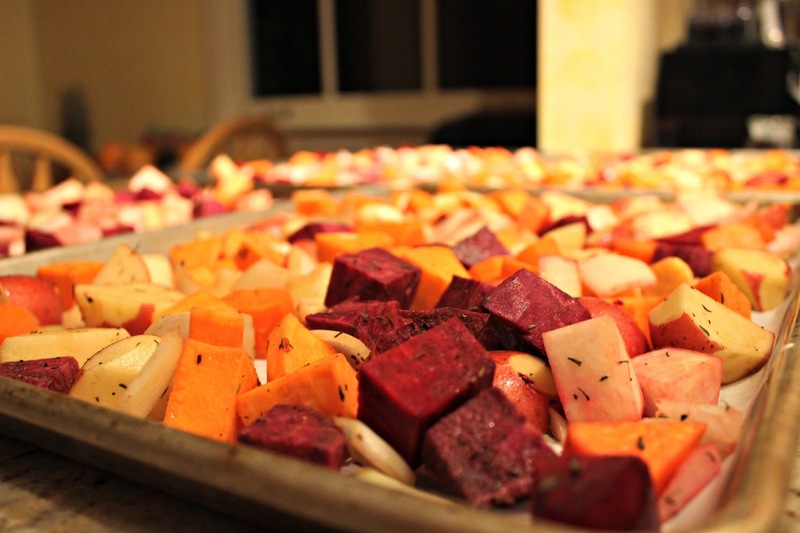 To start preheat your oven to 400 degrees and gather all the (organic) root veggies you find delicious. 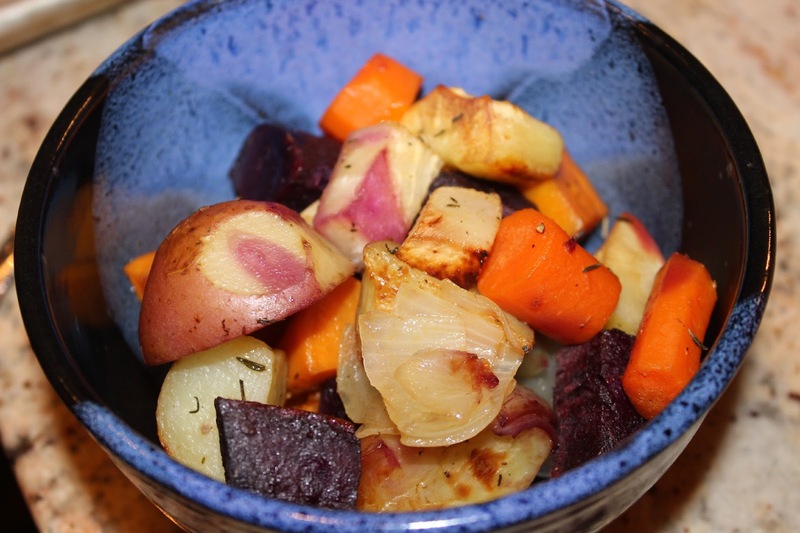 I used my go-tos: sweet potatoes, red roasting potatoes, carrots, beets, and onions, and added a few new flavors: parsnips, purple sweet potatoes, and turnips. 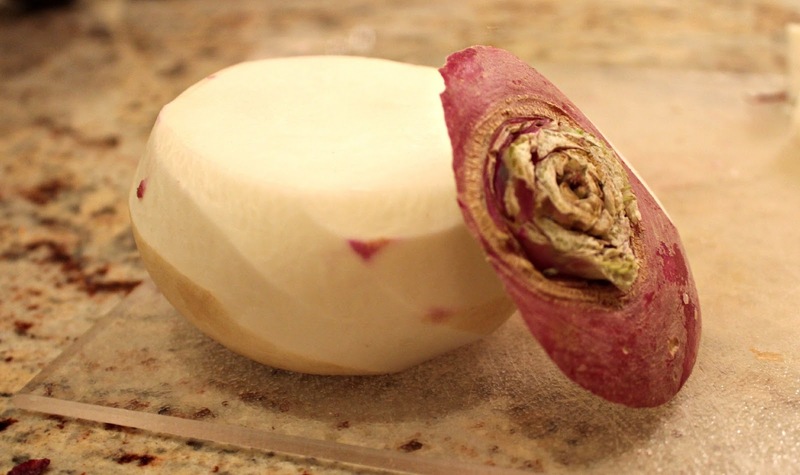 Turnips happen to be the featured food on this week’s Better With Veggies Meatless Mondays A-Z challenge. Thank you so much to darling Heather for inviting me to join in this week! Prepping for a huge batch like the one I’ve made takes a while, but it saves so much time in the coming week. I use these roasted veggies instead of hash browns at breakfast, tossed in salad at lunch, and as either my whole meal or a side at dinner. To prep, wash and peel everything and then chop into chunks that are roughly a uniform size so everything will cook evenly. Sadly, the turnips lose their pretty purple tops, but slicing into beets and purple sweet potatoes reveal some gorgeous patterns and colors. 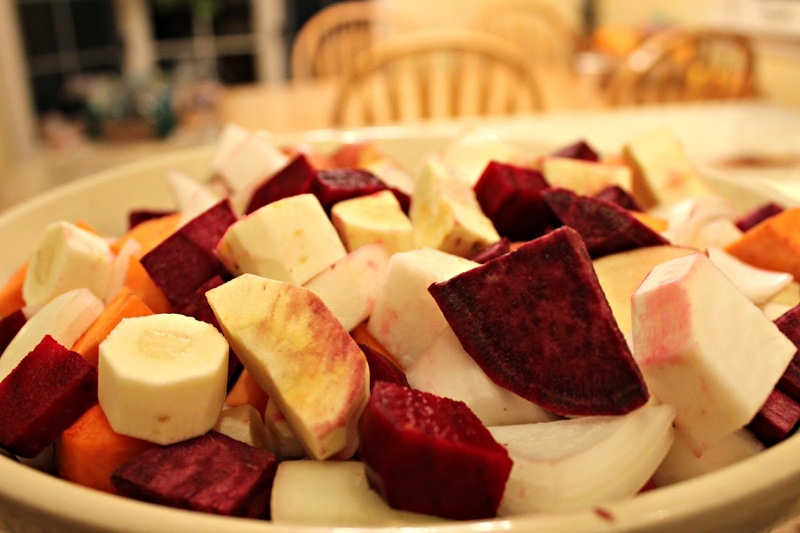 Tip: when handling dark-colored root veggies like beets, try wearing a pair of food preparation gloves so you won’t stain your hands. The first time I prepped beets I ended up looking like I was bleeding for days! Throw all of your veggies in a bowl (or three in my case) and drizzle some extra virgin olive oil over top. Mix this in to thinly coat all of the vegetables, adding more if needed. I used approximately two tablespoons per bowl. I then added about a teaspoon of freshly ground black pepper, about a tablespoon of thyme, and about a teaspoon of garlic powder. All of this is to taste, the process is truly trial and error. I happen to love my spice ratio above, but have left out garlic powder when I had run out and really enjoyed the outcome. The rich flavors of root vegetables really steal the show in dishes like these, the spices just add a bit more interest. Spread your veggie mixture onto baking pans lined with parchment paper in a single layer. Pop these into the 400-degree preheated oven, and set a timer for 45 minutes. However, it is a good idea to check your dish during the roasting process to make sure you take the vegetables out when they are done to your liking, it might take longer than expected for especially crispy bits. The vegetables are ready when you can pierce the largest pieces easily with a fork and they are slightly browned. · Roast for approximately 45 minutes or until easily pierced and slightly browned. 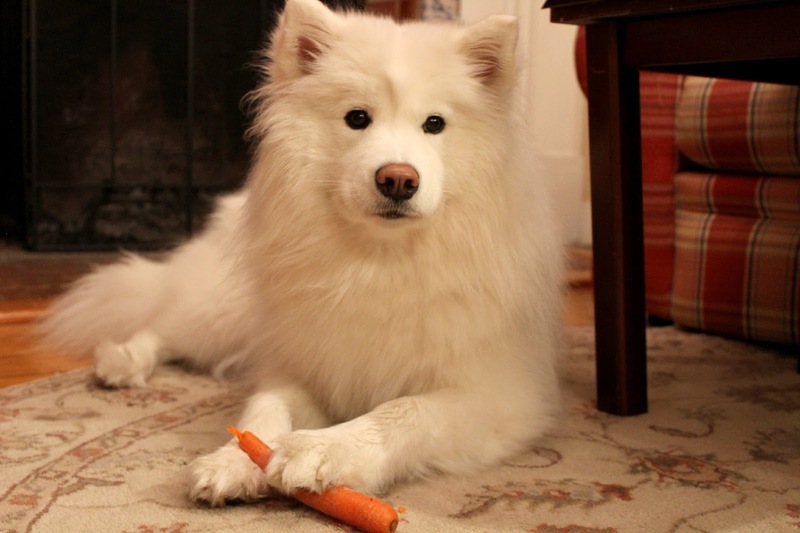 Have fun playing around with this versatile dish, and make sure you’re careful when gathering your ingredients or your fluffy friends might pilfer a wayward carrot. Silly Tinkerbelle got her paws on one. Question: how do you keep from crying while chopping onions? I’m constantly looking for a way to stave off the tears but am always unsuccessful. Let me know your tips in the comments below! nice post. I wish we were to follow the one to the other? Yummeh!! It looks delicious and healthy!! And your dog is just too cute for word!! I just followed you, do you mind follow back? wow this looks so so fresh and delicious! yummy =) and love the last photo of your dog, so cute! I only buy Maui Sweet onions and they hurt your eyes soooo much less when chopping. I have also heard that chewing gum helps! :] Love that you're going Meatless on Mondays! I've gone from Meatless Monday's to full blown vegetarianism and I'm feeling good. Cheers! that is the most appetizing vegetables i've ever seen! 🙂 looks so yummy! Hi there just found your blog 🙂 Lovely lovely recipe! I'm a huge fan of big batches of stuff, especially if they can last for a few days. Perfect for abit of healthy eating aswell. Thankyou for posting! um yummy and healthy post!